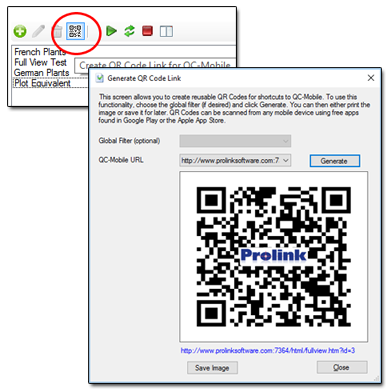 Prolink is the first in the industry to provide QR Code linking directly to relevant data in QC-Mobile. Throughout ERS, there are buttons that allow you to create direct links to QC-Mobile via QR Codes. At present these are available in the Full View, Dashboard, and Data Group screens. Choosing an item to link and selecting the QR code generator button are all you need to do to generate codes that can be mounted throughout your shop. Imagine walking down the main aisle of the plant and being able to access the current status from any of several QR codes right on your smartphone! Engineers can now set up specific sets of data in ERS with relevant features and filters all linked through a simple QR code that can be printed and scanned by management. No longer does management have to understand the complexities of dimension and record filtering, report templates, or other parameters in order to quickly find the status of a process. All that's needed is a mobile device on the local network and a QR code scanning application from the app store. Below are a couple of free applications you can try. **In this app, it is recommended that you go to settings and turn off the "Open in App" flag. Turning it off will cause the scanner to open links in Safari rather than inside the application's own browser.